WordPress is one of the most flexible and powerful content management systems (CMS) out there and it powers nearly 74.6 million websites. It’s no surprise that bloggers turn to WordPress when they decide to launch a new blog. A well-designed blogging theme can improve your site’s visual appeal and make it easier for your viewership to navigate through your website. These themes are designed specifically to cater to the needs of bloggers and draw attention to blog posts. Although there are a ton of free alternatives available, it’s advisable to go for a premium theme that comes with high-end features and add-ons. Bloggers with a flair for design will agree with me when I say that selecting a theme for your blog definitely makes setting up a blog enjoyable. In this article, I’ll run the rule over some of the best blogging themes for WordPress that you can leverage – whether you’re operating a niche blog or sharing your experiences with the world. Let’s get on with the list! 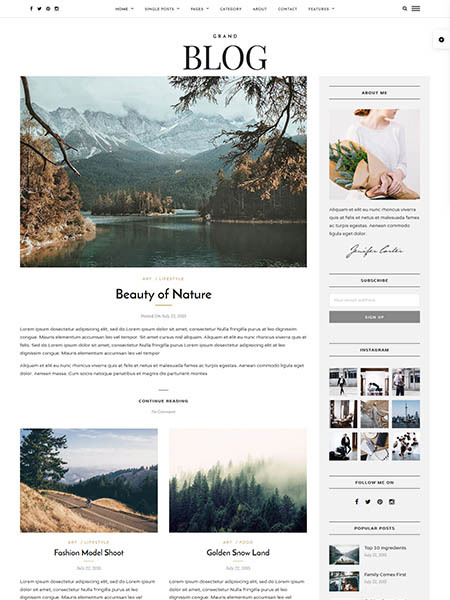 The Essence is a beautiful, stylish and sophisticated theme perfect for the modern blogger. This theme is powerful, feature-rich and very customizable, so you can easily build a blog that perfectly reflects your brand identity without hiring a developer. The Essence has multiple layouts to choose from, a featured slider and custom About and Social widgets. You can also change the appearance of almost any element of the theme with tons of options for colors, typography, background, and more. This theme also comes with social sharing integration to help you get the word out about your content and build your following. 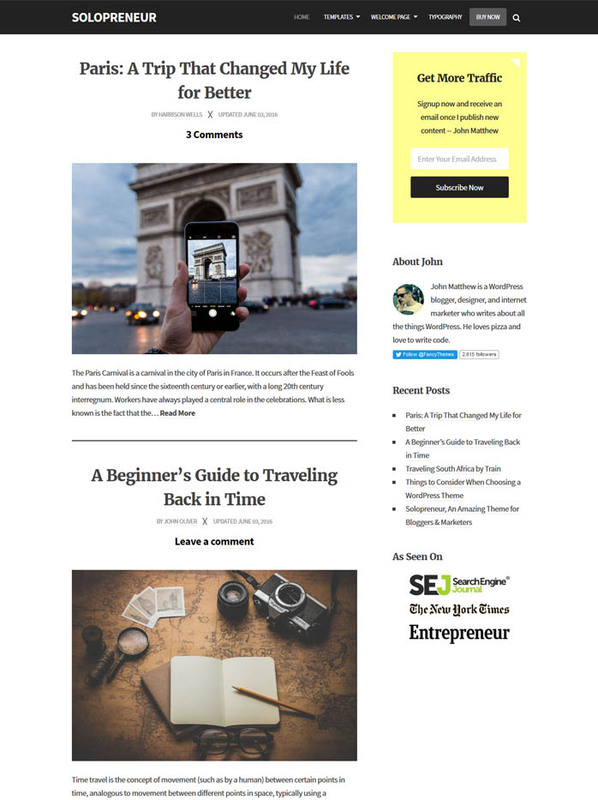 Solopreneur is a simple yet sophisticated blogging theme that puts your content center stage. One of the best things about this theme is that it is designed with bloggers in mind and features blog centered functionality such as a call to action in the footer and a last updated tag. Solopreneur is integrated with social media buttons and support for Optin Forms to allow webmasters to create engaging subscription forms. Another standout feature on offer here is that the theme comes with two landing pages that allow users to boost conversion rates with minimal effort. 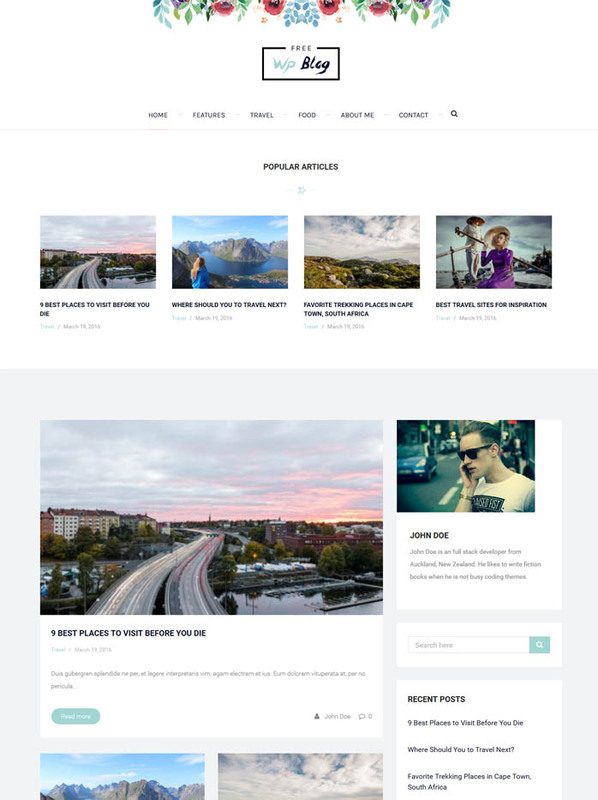 The Traveler is a clean and modern WordPress theme designed specifically with the travel blogger in mind. 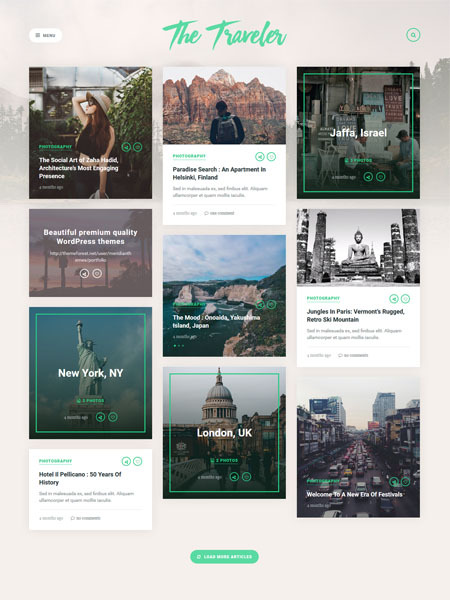 This theme has an elegant, grid-based layout that puts your travel photos at the center stage – it’s the perfect theme for visual, image-heavy blogs. The Traveler comes with hundreds of customization options including multiple layouts to choose from and the ability to change the appearance of almost any element of the theme. Using the MeridianStyler, you can personalize your blog’s colors, typography, background, and more to get the look that’s right for you. A blogging theme that not only looks good but also delivers an exceptional browsing experience can be difficult to find. Palmas features a simple yet elegant design that gives an artistic look to the entire page which helps to captivate your visitors’ attention. It is also highly responsive meaning that the theme will open easily without errors on devices with all screen sizes. Additionally Palmas also features the basic theme customizers and side-bar widgets. The performance is also quite excellent so the theme will not slow down your website. Palmas uses big imagery to capture your visitor’s attention. The homepage of Palmas consists of a large image slider so if you’re into photography then this would work best for you. 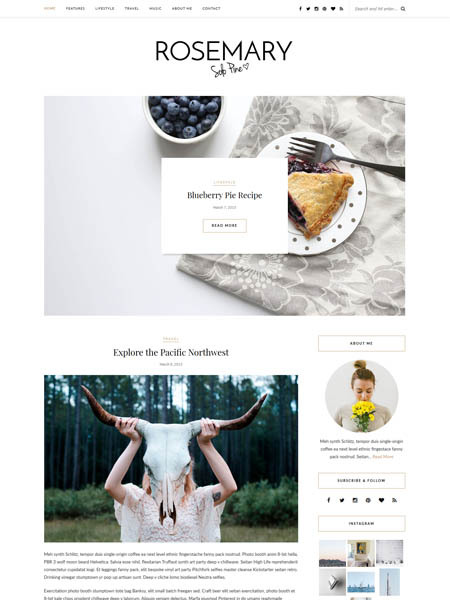 Risa is an all-out minimalist blogging theme that allows bloggers to do what they do best – blog! This lightweight theme is well-coded and optimized to deliver an incredible browsing experience to your site’s visitors. The theme comes with social media icons built into its unique sidebar menu. One of the best features about this theme is that no matter where your visitors are on your site, they’ll be able to view your blog posts at all times. Risa features an enticing menu bar that allows users to navigate to the sub-menu. If sites like Exposure and Medium pique your interest then you’ll love the Ink theme. Ink enables webmasters to effortlessly create a blog site that’s in line with the latest design trends. This theme focuses on storytelling and helps authors captivate their visitors’ attention right off the bat. Ink’s built-in live customizer allows webmasters to modify their site and preview the changes on the fly. The standout feature on offer here is that Ink allows users to restrict access to content by converting your website into a premium membership site. Webmasters can play around with different layout styles and find the one that allows them to communicate their content best with their readers. 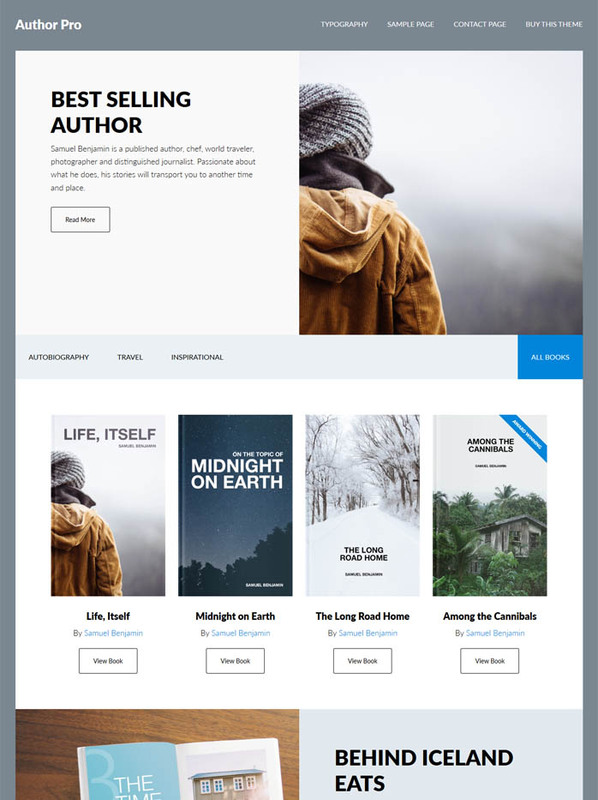 Author Pro is an advanced, professional theme for published authors that enables authors to showcase their books effectively. 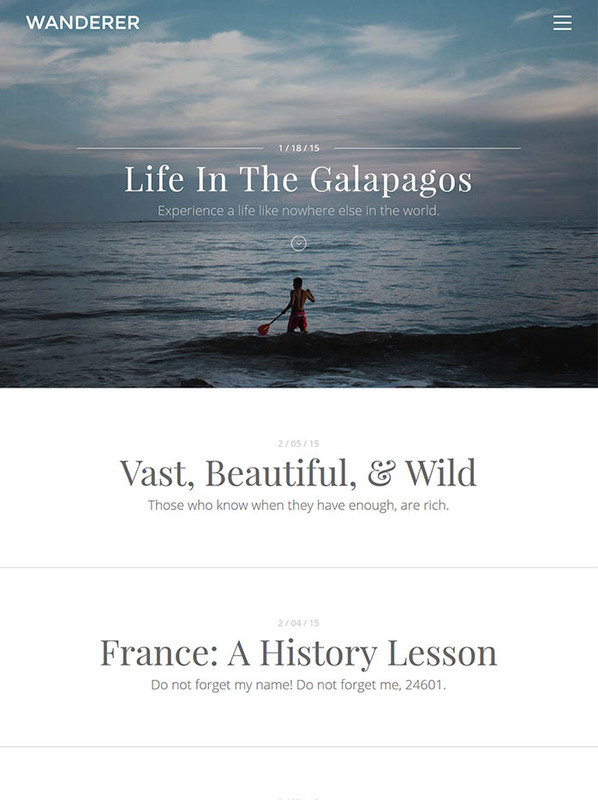 This theme is definitely worth trying out when you’ve taken blogging to the next level and written a book or two. Author Pro comes with the Genesis Framework, unlimited updates, and support. The theme’s endless color styles and theme customizer give users the ability to personalize their blog site and ensure their readers receive the best possible browsing experience. If you’re ready to take your blog to the next level (or even start out with a professional-looking blog) then Schema has got you covered. The fully responsive, multipurpose theme comes with a wide range of premium-quality features packed into it. Not only do you get the usual customization options but the theme is also translatable and search engine optimized – two major factors behind the success of any top-notch blog. 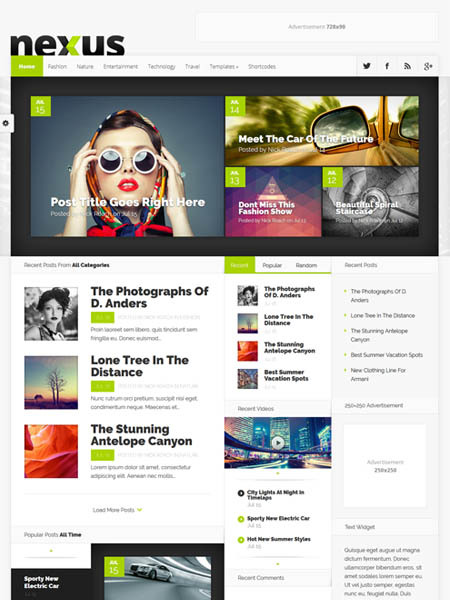 Nexus, by Elegant Themes, is a multipurpose theme that is ideal for all sorts of blogging sites. 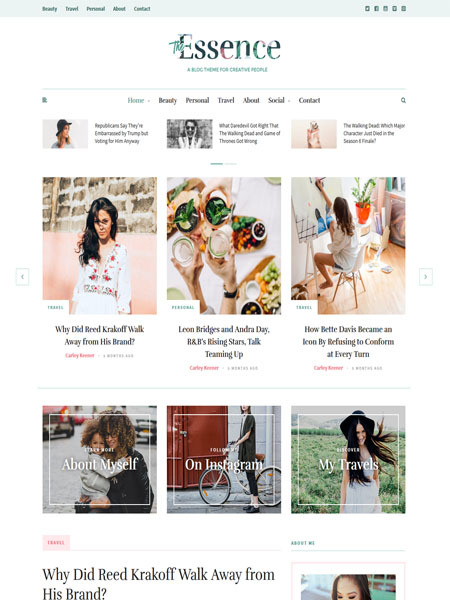 The best part about this theme is that it is essentially a magazine theme which simply means that you can rest assured it’ll present your content in a well-structured layout. If you’re thinking about launching an image-heavy blog then Nexus is hands down one of the best out there. The theme comes with built-in advertisement areas and a homepage builder to allow users to fully customize their blog from the start. With unlimited color options and a wide range of custom widgets to pick from, Nexus is a must-have! Wanderer is one of the most modern-looking themes out there that let bloggers showcase their writing in an elegant manner while giving it a modern characteristic that’s hard to find elsewhere. One of the features that immediately caught our attention was that the theme includes Photoshop file which makes it much, much easier to design projects and apply intricate customization. The theme’s default typography paired with its color scheme is bold, striking, and easy on the eyes – a quality that is all too rare. 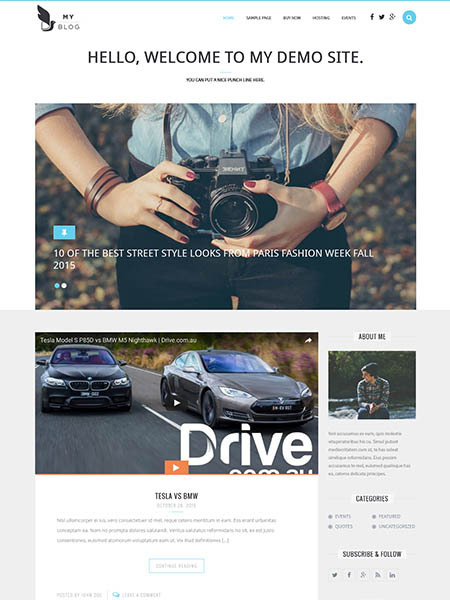 Karen is a lightweight WordPress theme that features a minimalistic layout. It features social media icons in the footer section to allow your blog’s readers to share your content on their social media networks. Karen ships with several different page and post types to cater to niche blogs. This one of a kind theme allows bloggers to display images just about anywhere on their page to accompany the text. Karen is optimized for performance and delivers fast page load times which guarantees low bounce rates. In addition to this, the Karen theme is mobile friendly from the get-go allowing webmasters to cater to the growing mobile traffic. Publisher features a masonry layout which has gained popularity over the last few months due to its versatility. To quote the designers behind this one-of-a-kind theme, “Publisher is an eclectic scrapbook of photos, videos, audio and more”. This fully responsive theme features infinite post loading which subjects users to a consistent browsing experience they won’t forget. One of Publisher’s standout features is that it enables users to customize the entire theme in real-time to make it more personal and coherent with their brand identity. You can change everything from the site title to the header! Grand Blog provides bloggers with the right set of tools to launch a successful blogging site right off the bat. This one of a kind theme comes with 20+ blog layouts presenting users with a ton of different pre-set customization options to pick from. 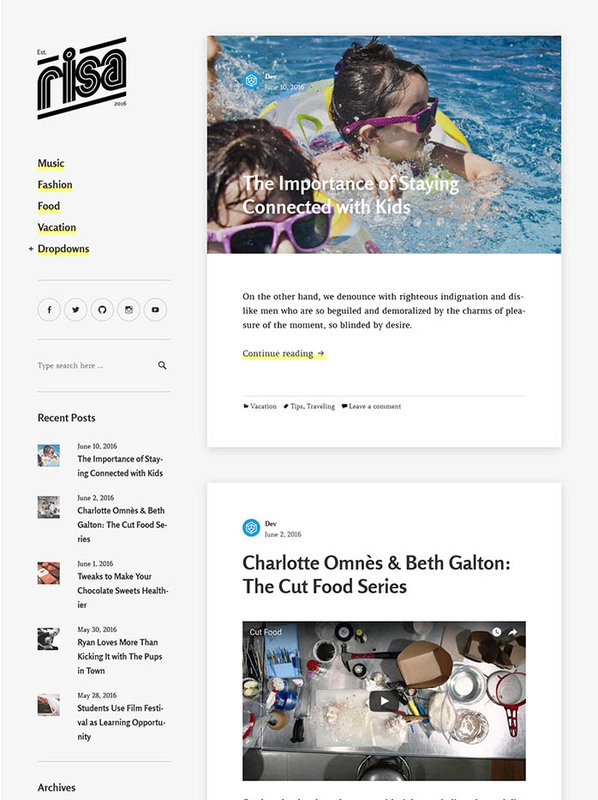 This theme was, without doubt, built specifically for the modern blogger. It’s got everything one would need to have their site become successful. 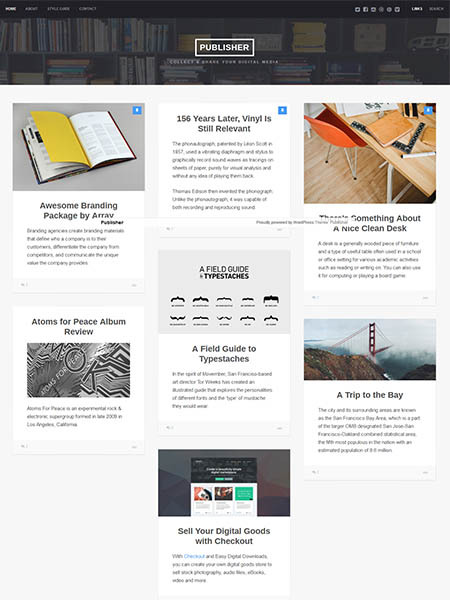 Premium features for a low-cost theme – Grand Blog is a grand blog theme indeed! Those of you who are absolute blogging fanatics would be better off with a WordPress theme that can take care of your potentially content heavy blog. The MyBlog theme is a professionally designed and visually appealing theme that comes with two different homepage layouts and slider options right out of the box. One of the best features you get with MyBlog is that the theme is already optimized for search engine. You can start monetizing your blog from the very start! Inspired by the layout of newspapers and magazines, SoloPine’s Rosemary is a popular choice among blog and magazine themes. The theme’s bold lines and amazing typography selection draw the reader in and encourage them to keep reading. 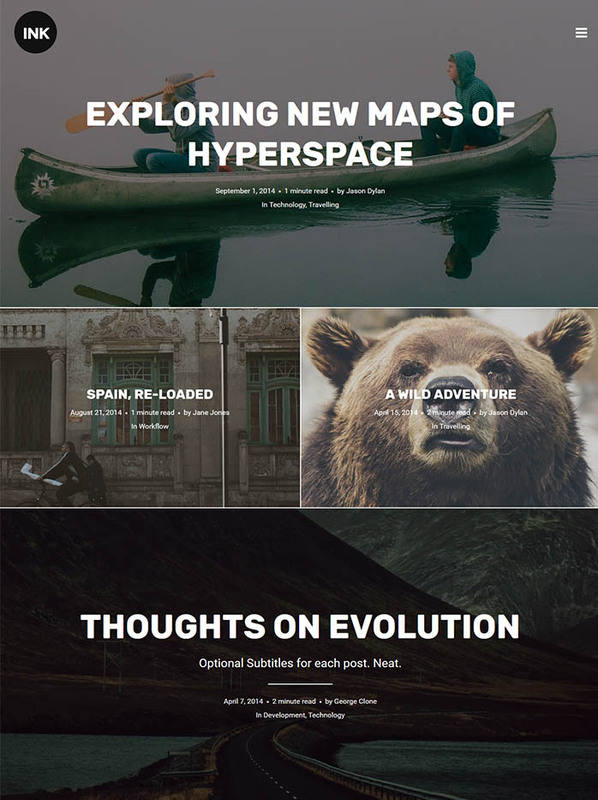 Watson shatters the traditional newspaper format by introducing a custom slider on the homepage to effortlessly display featured posts without taking up a ton of screen real estate all at once. Lightly is a WordPress theme that is incredible easy to use and gives off an elegant aura at the same time. 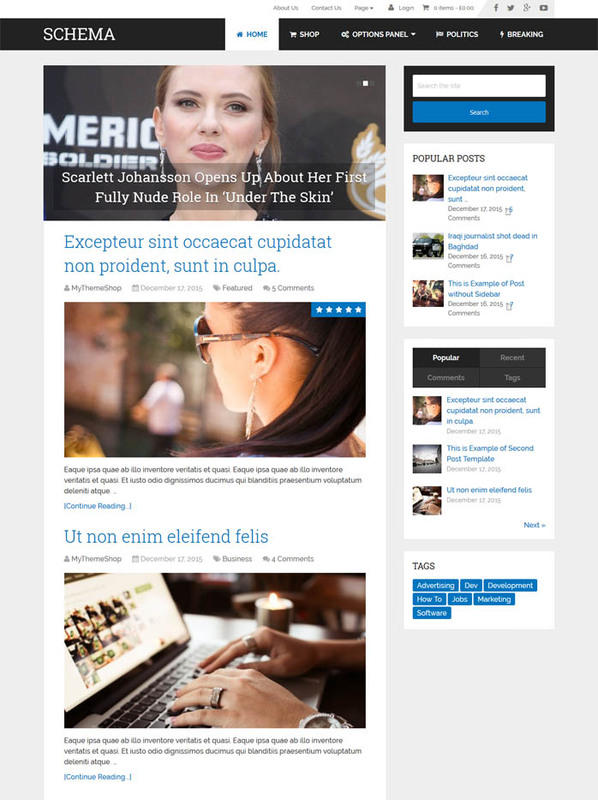 If you have a news or magazine style website then this theme would be a perfect fit. Lightly is easy to install and setup so if you’re a beginner then you won’t have any problems with it. 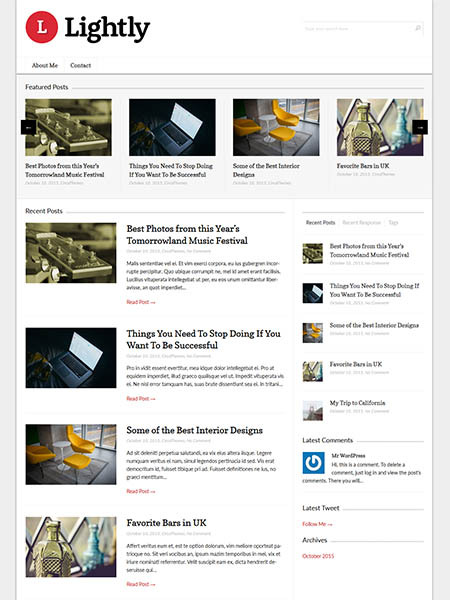 This modern-esque theme is a great fit for any magazine style website that focuses on displaying images effectively. Responsiveness of a theme is quite an important feature when it comes to choosing themes so that the theme would fit in any screen size of the user’s device – whether it is a mobile phone, tablet, or desktop device. With this theme, you’ll be able to deliver a valuable browsing experience to your site’s visitors. 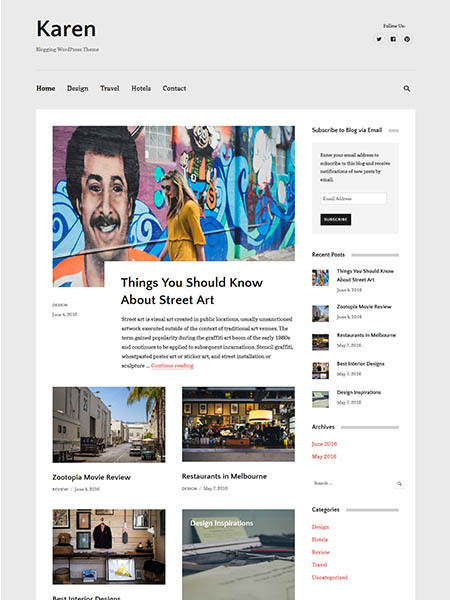 Uncode is a pixel-perfect WordPress theme that is ideal for blog sites. 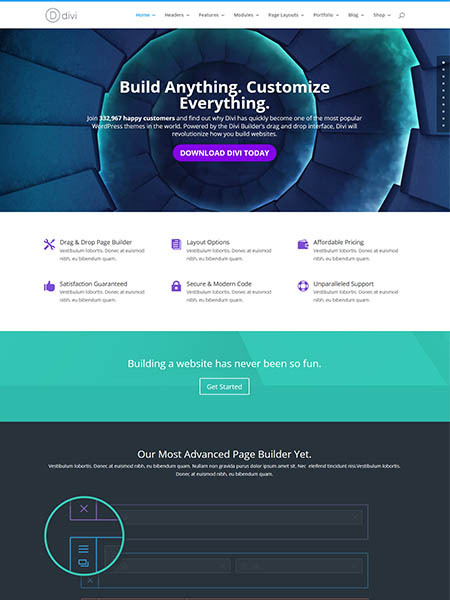 The developers behind the scenes have created over 30 concepts for the Uncode theme allowing webmasters to choose which one fits their site’s needs best and try out different options when it’s time to give it a makeover. The theme is compatible with popular plugins like WooCommerce, Visual Composer, Revolution Slider, and WPML. Uncode features adaptive image functionality which detects the reader’s screen size and re-scales images accordingly ensuring your visitors receive an optimal browsing experience. With this theme, you’ll also get several different menu styles and module variations to pick from. 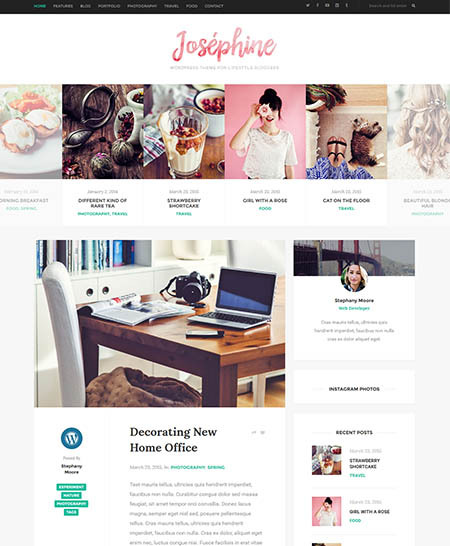 If you are looking for a well-balanced, professionally designed theme with a visually enticing design then Josephine fits right into that category. It is a fully responsive theme which ensures that your site will look great on any device your visitors access it from. This lightweight theme is cross-browser compatible. Josephine is loaded with customization options to help you set up the perfect site. It provides unlimited colors to use from to make your website fit your business needs as well as the option of adding a custom logo. This allows webmasters to infuse their business’ brand into their website giving it a professional look. Along with all these great features, you’ll also get regular updates for the theme. 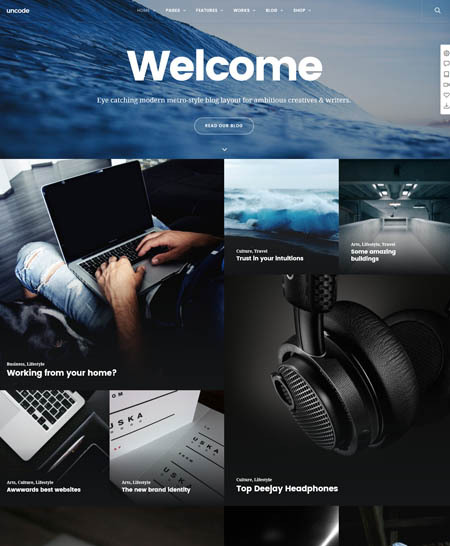 Divi is a powerful and flexible theme that can easily be adapted to use for a personal blog, portfolio, business or corporate site. The latest version introduces a powerful and intuitive front end visual editor powered by Divi Builder, allowing you to edit your site in real time, and see changes immediately. Divi contains 46 content elements, adding extra functionality and visual impact to your site. This theme boasts tons of customization options, and allows you to easily change colors, typography, spacing, and more. Divi makes it easy to build a beautiful, functional website without needing to touch a line of code. ing it a professional look. Along with all these great features, you’ll also get regular updates for the theme. 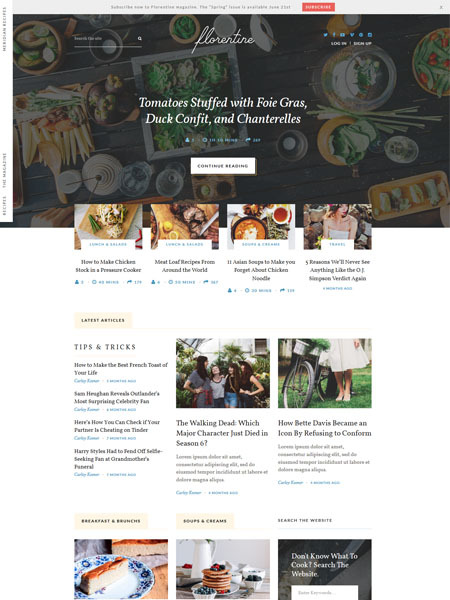 Meridian Recipes is a modern, contemporary theme crafted with food bloggers in mind. Highly customizable, you can choose from 19 different modules to build your sitewithout ever needing to touch a line of code. And you have the option to change the appearance of almost any element with the Meridian Styler. Meridian Recipes is a feature-rich theme. Your readers will be impressed by the 5-star rating and bookmarking system that allows them to create their own profile and keep track of their favorite recipes. Distraction free cook-mode and print-friendly recipes are two other useful features. Meridian Recipes makes it easy to build a quality, modern food blog from scratch. A good blog theme can positively intensify your blog’s appearance and give your readers a reading experience they won’t forget. The blog themes we’ve compiled above should give you a fair idea of the absolute best blog themes out there and help you select one for your site. Which blog themes have you tried out? What features do you look for in your ideal blog theme? If you have some themes you’d like to recommend, let us know in the comments section below.